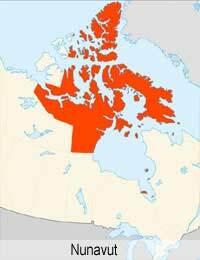 The North of Canada is basically the three territories of Nunavut, Yukon, and the Northwest Territories. If you’re in Nunavut you’ll need to be steel yourself against some pretty cold temperatures but the beauty of the region makes up for this. Most of the wildlife is to be found in the summer - in winter it can be just too barren. Iqaluit boasts several interesting museums and historical buildings, including the very first Hudson Bay Co store. There are tours that will take in the Illaulittuuq Outpost Camp, orif you fancy something more active, opt for a sledding expedition across Frobisher Bay or try kayaking and canoeing. In March there's fun to be had with a Snow Challenge snow mobile race from Iqaluit to Kimmirut and back. For a little bit of mystery, Marble Island is a white stone island that’s the stuff of spooky legend. The island has strong spiritual links for the Inuit people, and has turned out to be the final resting place for the crews of many of the long-wrecked ships that line the harbour. Yukon is the place to visit if your idea of fun is exploring scenic wilderness or perhaps a chance to see the Aurora Borealis. The territory was made famous by the Klondike Gold Rush. The capital, Whitehorse, is known as the Wilderness City. When weather permits, you can traverse some of the world's most beautiful hiking trails, taking in the Yukon river which flows right through the city, but despite the nickname and a mere 25,000 residents, you can also find plenty of things to do. The Yukon Wildlife Preserve is around 25 miles from Whitehorse, and there are guided wildlife tours as well as specialist ‘Aurora Borealis’ tours. Some of them include a cabin for the night and let you try dog sledding, snow shoeing and ice fishing as part of the deal. If a spa is your idea of fun, the Takhini Hot Springs is a bit different, it's a natural mineral water spa where you can chill out with scenic views and stay overnight in a cabin. Dawson City is the 'gold rush town'. These days there are just around 1500 people living there, but at the height of the gold rush it was understandably much more popular! Dawson City is still the second most populated town in the Yukon. It's like bein part of an old film, as you stroll along the wooden boardwalks, admiring the old, yet beautifully restored buildings. There's a plethora of fascinating museums and attractions in Dawson too. Canada's North West Territory is wild and in some parts also pretty inhospitable, but the NWT as they are known is also where you can investigate the beautiful Nahanni National Park and if the weather permits, try outdoorsy Canadian pursuits like canoeing, hiking, snowmobiling and dog sledding. Yellowknife, is the capital of the North West territories, and also one of Canada’s northernmost cities. If you're taking part in any major organised excursions and activities in NWT, you'll begin your adventure here. The stunning, rugged landscapes of NWT give vistors the chance to see the Northern Lights from late August until January. Fort Simpson is an area of sheer natural beauty, the meeting point of the Mackenzie and Athabasca rivers. This proximity has has made Fort Simpson an important gathering place for travellers over the centuries.